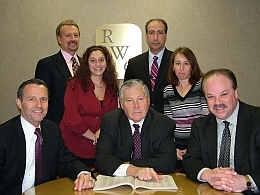 We the members of The RWC FINANCIAL Group realize that your goals and dreams are unique to you, requiring hands-on individual attention and guidance. Working as a team The RWC Financial Group will help you assess your financial dreams and aspirations, and help identify and prioritize your short and long-term goals. We are here to provide you with the necessary information you need to make important decisions and address the most intricate of financial concerns. With your goals in mind, we can help you meet your personal and family needs for asset accumulation, distribution and protection. If your objectives are providing meaningful, cost-effective benefits for employees and key executives and optimizing tax advantages, we offer an expansive array of innovative services. RWC FINANCIAL takes a hands-on approach, working together with our clients to prepare a plan that considers their own special needs, goals, time frame and risk tolerance. The combined experience of our members and their knowledge of a wide-range of products and services allow us the unique ability to provide top-quality financial strategies to enhance, protect and preserve client wealth. RWC FINANCIAL Group is not owned or operated by AXA Advisors or AXA Network.